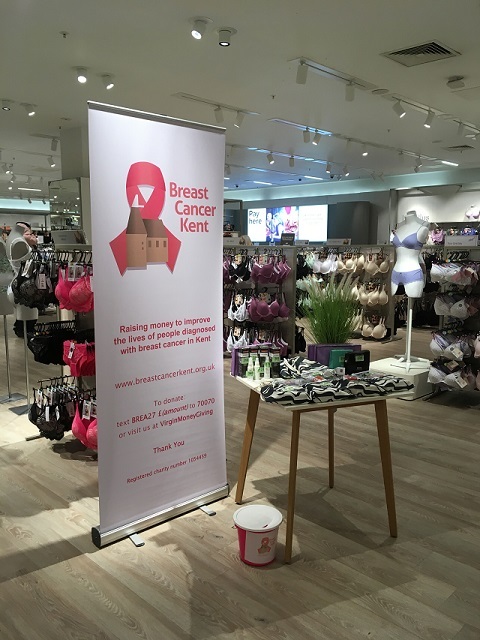 The Marks and Spencer Store at Bluewater Shopping Centre held a pamper evening for breast cancer patients in aid of Breast Cancer Kent whilst taking part in the £1,000 Challenge. Ladies were treated to makeovers, manicures and hair styling along with expert advice on the fitting and choosing of bras post surgery. M&S have just launched a beautiful new line of lingerie for post surgery. All this, with canapés and Buck’s Fizz in the prestigious Bluewater store! Donations were given to Breast Cancer Kent totalling almost £100 for their first event but putting them safely on track to raise £1,000 by the end of June for the £1,000 Challenge for Breast Cancer Kent. The event took place on 20th March and was aimed at helping local ladies to feel more body confident as they undergo treatment. Janet Payne, Lingerie Section Manager, said: “The fight against breast cancer is a cause that matters hugely to me and my colleagues. I’m fortunate enough to have recovered from breast cancer following radiography but several colleagues have had it worse than me. The evening was obviously a great success for all concerned and raised a great amount for the charity. Thank you ladies! Take a peek at the M&S post surgery bra collection here.